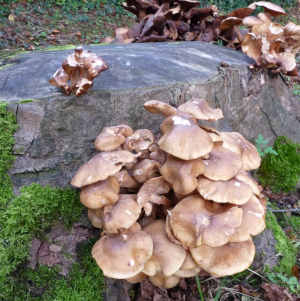 Observation - Fungi on tree stump - UK and Ireland. Description: This fungi was growing on an old tree stump. I tried smelling it to help with the ID but it just smelt like an edible mushroom! This fungi was growing on an old tree stump. I tried smelling it to help with the ID but it just smelt like an edible mushroom!